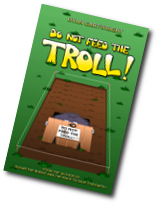 If you haven’t heard by other means already I am pleased to announce my latest children’s book Do not feed the Troll! has been published. It’s book two in what has become The Roboteers series (book one being Sugar the Robot and the race to save the Earth) and is about a family who move to a new house and discover a trapdoor buried under their back lawn. The trapdoor has a sign which reads “DO NOT FEED THE TROLL!” and inside they do indeed find a troll. What happens next is a hilarious adventure as the troll begins to take over their garden and their lives. The book is, like the first one, illustrated with fantastic drawings by my own children (thanks guys!) and aimed at 6 to 11 year olds. As with all my books you can get this as a free eBook in various formats under a Creative Commons CC:By-SA licence. You can also buy it in paperback and on eReader devices such as Kindle. As ever all other details are on the Crimperbooks website, Twitter account, Google+ page and Facebook page.